We Will Be Closed This Week (Oct 16 - 19th). Welcome to the Amherst Collision Service. Our auto body shop has been in business for over 40 years, providing some of the absolute best truck and auto collision services in Amherst and Williamsville, NY including dent removal, scratch repair and latest and most up-to-date auto painting services. Amherst Collision is family owned and family operated, and has maintained a strong presence on Main Street in the village of Williamsville for over four decades. When your vehicle needs collision service after an accident, count on the auto collision repair experts at Amherst Collision Service. Our friendly staff is ready to help you through every step of the accident repair process; from your very first phone call until the moment you drive away in your newly repaired car. We are very proud to offer all of our customer free estimates on auto body damage, lifetime warranty on all auto body paint and collision work as well as a free shuttle service within 3 miles! 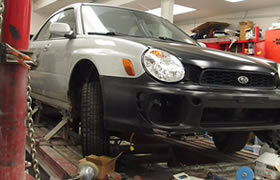 You'll be happy that you chose us, the most reliable and friendly collision service in Buffalo, NY. When Amherst Collision Service was first formed in 1972, it was begun with a simple mission in mind; to help residents of Amherst, Williamsville and the greater Buffalo area recieve prompt, courteous and affordable automobile collision service after an accident. Forty years later, Amherst Collision Service is still owned and operated by the same family, and remains committed to the values upon which our company was started. We hope that you'll count on the expert team of auto body collision repair experts at Amherst Collision Service! Here at Amherst Collision Service, we want all of our customers to understand just how important it is to get their vehicle repaired as quickly as possible after an auto accident or damage causing event. Many auto insurance companies require their policy holders to file a claim within a limited amount of time, and also require that collision repair be performed as quickly as possible. When you count on Amherst Collision Service, you can rest assured that you're in capable hands, and dealing with an auto collision shop that understands the complex world of automobile insurance. We'll do our best to make sure that claim is handled quickly and correctly so that your vechicle can get back to you as good as new in as little time as possible. During your repair time, Amherst Collision Service offers great rates through Hertz rental cars. A Hertz representative will drop a car off a rental car for you and help you fill out the paper work onsite. When your car is ready for pickup, just leave your rental here with us! After you're involved in a car accident there are many steps that need to be followed in order to make sure that your insurance company is properly notified and all paperwork is filed correctly. Read the tips in this article to make sure that following all necessary steps. 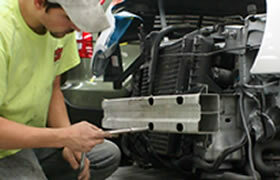 Make sure you choose Amherst Collision Service for your auto body repair service! The importance of regular maintenance and its effect on complete vehicle safety cannot be overstated. By making sure that all parts of your vehicle are running effeciently and correctly, you reduce the risk of sudden vehicle failure or a collision. For more information about the importance of keeping your vehicle in good condition with proper maintenance read this article.